Quercetin has multiple influences on immune system function, aside from its most commonly known mast cell stabilizing activity. * Transcription factors involved in immune function are controlled by cytokines and quercetin appears to play a role. * Cytokines are a major part of the immune system and function as mediators within the immune system and hematopoiesis, which is the process of creating new blood cells. Foods rich in isoquercitrin include leafy vegetables, broccoli, red onions, peppers, apples, grapes, black tea, green tea, red wine, and some fruit juices. The amount of quercetin received from food is primarily dependent on an individual’s dietary habits. Research has found a typical Western Diet provides approximately 0 to 30 mg of quercetin per day, but a diet rich in fruits and vegetables was estimated to provide more.1 It is also important to note, that the food content of quercetin reflects variations in soil quality, time of harvest, and storage conditions. It is common practice to evaluate dietary supplements in terms of food equivalence. In some cases it is not reasonable to consume food to reach a therapeutic or evidence-informed level found in dietary supplements while other times, it is a worthwhile exercise. 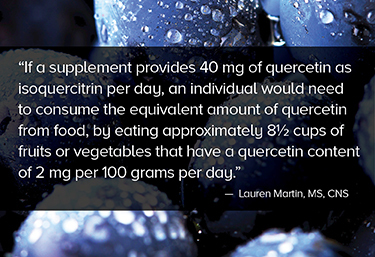 If a supplement provides 40 mg of quercetin as isoquercitrin per day, an individual would need to consume the equivalent amount of quercetin from food, by eating approximately 8½ cups of fruits or vegetables that have a quercetin content of 2 mg per 100 grams per day. Although this is within the recommended daily intake for servings of fruits and vegetables, the average consumption in the United States is much lower. Identifying foods rich in quercetin and analyzing the diet are a couple of simple ways to estimate daily consumption of quercetin and determine any supplementation considerations. Be mindful of the power of flavonoids, and give special attention to quercetin and its applications. While a number of dietary assessment programs exist that evaluate everything from Calories, macronutrients, and micronutrients, these can be overwhelming for patients in many cases. Using an online database in relation to a specific food constituent can be an excellent exercise. Phenol-Explorer is one such online database. After evaluating a three-day food diary and noting, in this case, quercetin consumption can provide insight into whether or not lifestyle or dietary changes are required. As with many products on the market, drug and nutrient interactions can affect quercetin supplement recommendations. Find a complete listing of those drug-nutrient interactions, both documented and theoretical. D'Andrea G. Quercetin: A flavonol with multifaceted therapeutic applications? Fitoterapia. 2015;106:256-71. Baghel SS, Shrivastava N, Baghel RS, Agrawal P, Rajput S. A Review of Quercetin World J Pharm Pharm Sci . 2012 1(1): 146-60. Yang F, Song L, Wang H, et al. Oncol Rep. 2015 Jun;33(6):2659-68. Ishisaka A, Kawabata K, Miki S, et al. Mitochondrial dysfunction leads to deconjugation of quercetin glucuronides in inflammatory macrophages. PLoS One. 2013 Nov 19;8(11):e80843. de Oliveira MR, Nabavi SM, Braidy N, Setzer WN, Ahmed T, Nabavi SF. Quercetin and the mitochondria: A mechanistic view. Biotechnology Advances. 2016;34(5):532-49. Phenol-Explorer, Database on polyphenol content in food, Food composition; http://phenol-explorer.eu/contents/polyphenol/293(Accessed October 18, 2016).